This pair of knee socks is for a child aged 7 - 10 wearing shoe size 1-5. 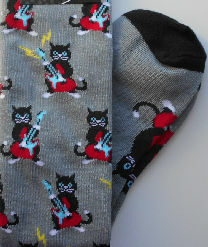 A tuxedo cat is playing an electric guitar. These grey socks are 75% cotton, 23% polyester, 2% spandex. New.